I'm back....very tired and in desperate need of a relaxing weekend (defiantly not on the cards!) but I had a great time! I wasn't too sure what to expect of Istanbul, but snow and 2 degrees definitely weren't my first thoughts - It was FREEZING!!! I was there on a work trip, to buy the final pieces for Summer and to fill some of the Autumn range...on that front it was a really successful visit and we spent A LOT of money!!! Unfortunately for the blog it was pretty much non-stop work...I didn't really get to see too much of Istanbul itself, apart from through a cab window or from my hotel room! When we finally got to our hotel on Tuesday it was already 6pm, too late for any work to commence so we decided to make a very speedy trip to the Spice Market. This was literally an expanse of windy cobbled streets littered with all types of stalls and shops...from heaped hessian bags full of spices, dried fruits and nuts, to stalls shouting about fresh fruit, veg and fish. If you have some patience and make your way around the men shouting, pushing wooden carts into you and for us, slipping all over the place on snow covered cobbles, you will also find your way to many shops busting full of bags, clothes and my favourite, jewellery! I (for once) was very restrained and didn't buy anything, however that didn't stop me whispering into Emma's (my buyers) ear and persuading her to purchase the most gorgeous ring! We got into the spirit and attempted to barter on the price, not very successfully as when he joked about a student discount i pulled out my work pass, but i got a lucky blue stone as a reward for my efforts from the pervy Turkish market-man!! The shops were full of gold and silver jewellery littered with beautiful coloured stones, my heaven! 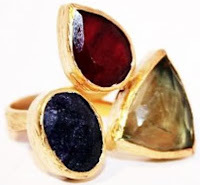 There were lots of rings in the style of Ottoman Hands (they have a concession in Topshop), a brand established by Deniz Gurdal who works with gem cutters in Turkey to create their works of art! I loved them and am now a bit upset I didn't snap one up, but after a long day of travelling I couldn't decide on a colour combination...in the words of Pretty Woman - BIG mistake, HUGE...I will just have to go back!!! From then on it was all work and no play...lots of serious calculator tapping, price negotiation and small team spats about jumper embroidery, but we eventually made it out in one piece....and to dinner!! We were very kindly taken to X Restaurant which is located on the top floor of IKSV's (Istanbul Foundation for Culture and Arts) building in Deniz Palas. You are taken up to the top floor in a teeny tiny lift and arrive in a very dimly lit reception area. As you walk into the restaurant you see why, one side of the room is a wrap around floor to ceiling glass wall...the lights, buildings and hustle and bustle of Istanbul glow right before your eyes...it really was a breath taking view! The beauty of the restaurant is wherever your table is located you can see out over the view, we had a perfect position right by the window and terrace. I can imagine the terrace would be amazing in the summer, ideal for alfresco dinner and drinks. However on our snowy visit it could only be used for speedy smoking breaks! The interior is decorated with impeccable taste...dark wood tables, black Louis Ghost style chairs, beautiful paint splattered plates and quirky spirals of silver balls hanging from the ceiling. Very chic but with fun twists added for good measure! The menu is a fusion of Turkish and Mediterranean, I struggled to choose as everything sounds incredible...for me there is nothing worse than food envy! I opted for Scallops to start, followed by lamb shank with an amazing risotto and all topped off with the best dessert i have ever eaten! A trio of heaven...chocolate Crème Brûlée, tropical sorbet and a chocolate fondant....I was not disappointed!! Overall a great trip...lots of hard work and fun, but another visit is definitely required to see the true Istanbul, and of course really explore that shopping....!